NVIDIA Home > Support Home Page > Knowledgebase Home Page > How can I tell if an application is being rendered on the integrated graphics or dedicated NVIDIA GPU with an Optimus/Microsoft Hybrid graphics laptop? How can I tell if an application is being rendered on the IGP or GPU with NVIDIA's Optimus/Microsoft Hybrid graphics technology? 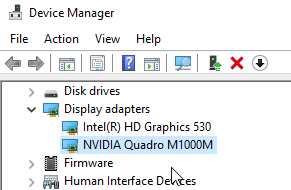 2) This will bring up the NVIDIA Control Panel. 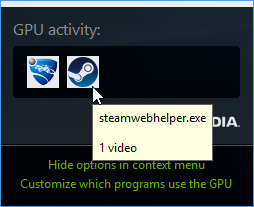 To display the GPU activity icon in the Windows taskbar, click on Desktop from the menu bar and select Display GPU Activity Icon in Notification Area. 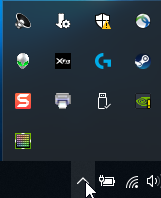 3) On the bottom right hand corner you should see the new GPU activity icon. Double click on the icon. 4) The GPU activity utility will show which applications are currently being rendered on the NVIDIA dedicated graphics. If you do not see any icons displayed, this means all of the open apps are being rendered on the integrated graphics.